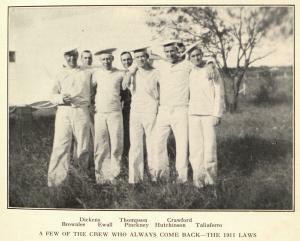 The UT Law class of 1911 was a particularly tight knit group. Before their graduation in May 1911, the Eleveners, as they called themselves, adopted a resolution laying out the framework for an alumni organization and annual reunion. The stated goal of the reunions, to be held during commencement week, was "to draw the members of this class together by fostering a closer and better class spirit." 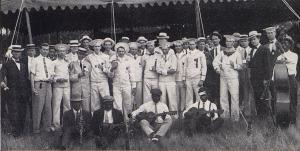 A committee was established to arrange "for the rental of a house or tent as class headquarters during the reunion, to arrange for a class 'Peerade' in class uniform, for a baseball game with the then Senior Law Class, for a class banquet." Their first reunion, held in 1912, was a small affair. The following year's reunion in 1913 proved to be a grander occasion. The Eleveners decided to wear a distinctive costume to the reunion and they settled on adopting a sailor suit as their class uniform. The Eleveners wore their suits not only to the reunion but also to the meeting of the UT Alumni Association. The sailor suits were complete with bellbottoms, middy tops, and hats. 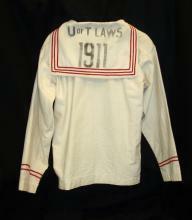 Stenciled on the shirts' collars, it read "U of T Laws 1911." A tent was set up on a vacant lot off Speedway across from the law building where a string band entertained the crowd of alumni, students, and guests. The Eleveners competed against the class of 1913 in a game of baseball on Clark Field. One Elevener reported winning by what he called a "substantial score," although admitting their victory to be the result of "compassionate pitching or inattentive umpiring." The reunion must have been a raucous party, with some Eleveners requesting the class adopt a more orderly and proper public program in the following years. Of the 1913 reunion Rex Eubank reported, "From what I've been told, I must have had a roaring good time." Steve Pinckney said of the reunion, "I am not exaggerating in saying that each of us who was present in costume had perhaps the best time of our lives." The Tarlton Law Library's Special Collections recently received an Elevener's sailor shirt as a donation from Phyllis Jeschke. 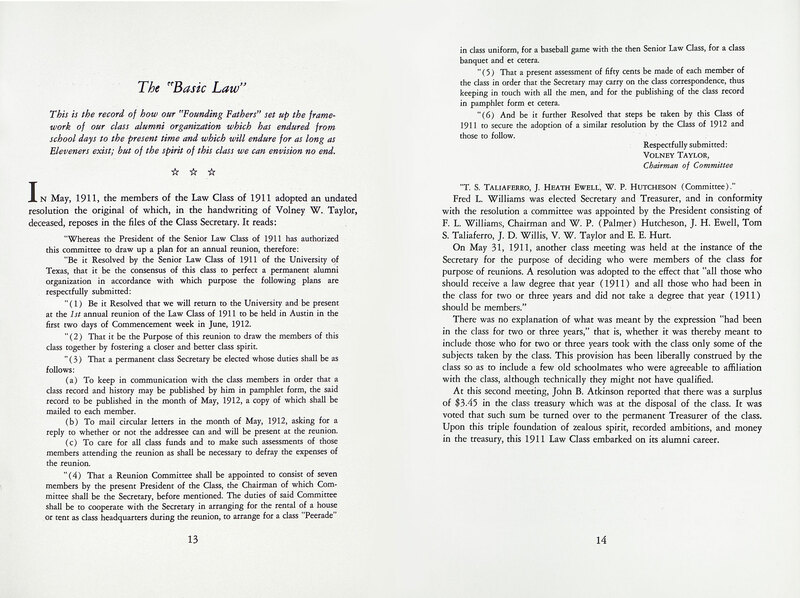 Come by the Special Collections reading room on the fourth floor to view this and other artifacts from the early years of the UT Law School.